In the peripheral nervous system (PNS), specialized glial cells called Schwann cells produce myelin, a lipid-rich insulating sheath that surrounds axons and promotes rapid action potential propagation. During development, Schwann cells must undergo extensive cytoskeletal rearrangements in order to become mature, myelinating Schwann cells. The intracellular mechanisms that drive Schwann cell development, myelination, and accompanying cell shape changes are poorly understood. Through a forward genetic screen in zebrafish, we identified a mutation in the atypical guanine nucleotide exchange factor, dock1, that results in decreased myelination of peripheral axons. Rescue experiments and complementation tests with newly engineered alleles confirmed that mutations in dock1 cause defects in myelination of the PNS. Whole mount in situ hybridization, transmission electron microscopy, and live imaging were used to fully define mutant phenotypes. We show that Schwann cells in dock1 mutants can appropriately migrate and are not decreased in number, but exhibit delayed radial sorting and decreased myelination during early stages of development. Together, our results demonstrate that mutations in dock1 result in defects in Schwann cell development and myelination. Specifically, loss of dock1 delays radial sorting and myelination of peripheral axons in zebrafish. Myelin, a lipid-rich multi-membrane structure, is an innovation of jawed vertebrates that enables the efficient conduction of action potentials. Schwann cells are the myelinating glia of the peripheral nervous system (PNS), and one Schwann cell myelinates one axonal segment. Schwann cells are derived from the neural crest and undergo a distinct series of developmental stages [1, 2]. These developmental stages of Schwann cells require migration as well as unique and substantial changes in cell shape. Schwann cell precursors (SCPs) migrate great distances longitudinally down peripheral nerves. SCPs develop into immature Schwann cells, which undergo a unique process called radial sorting in which Schwann cells extend processes into axon bundles and select an axon to myelinate . Prior to myelination, Schwann cells wrap themselves 1–1.5 times around a selected axon segment in what is termed the pro-myelinating state. A mature Schwann cell extends and wraps its membrane to form a myelin sheath around an axonal segment. Cytoskeletal dynamics are needed to facilitate these different stages of Schwann cell development and extensive changes in cell shape, but the intracellular intermediates between extracellular signals and the remodeling of the Schwann cell cytoskeleton are not well defined. The Rho-GTPase Rac1 is well known for its role in facilitating cell shape changes through regulating polymerization of the actin cytoskeleton and mediates Schwann cell development . In Schwann cells, differential levels of Rac1 direct when a Schwann cell stops migrating and begins radial sorting and myelination . Schwann cell-specific ablation of Rac1 in a mouse model causes delays in radial sorting and myelination, as well as aberrant Schwann cell process extension [5–7]. Furthermore, Rac1 can function downstream of β1-integrin in Schwann cells performing radial sorting ; however, the intracellular mechanisms that influence the temporal and spatial activation of Rac1 following extracellular signaling during Schwann cell development are not well understood. Guanine nucleotide exchange factors (GEFs) have the ability to temporally and spatially regulate the activation of RhoGTPases, such as Rac1, because many GEFs can regulate the same RhoGTPase . Roles of specific GEFs during distinct stages of Schwann cell development are beginning to be understood and help to broaden our knowledge of how extracellular signals are translated to intracellular signals in order to facilitate alterations in Schwann cell shape and movement [9–12]. In addition to canonical GEFs, atypical GEFs also have the ability to activate RhoGTPases. One such family of atypical GEFs, the Dock1-related GEFs, is composed of 11 family members, including Dock1 (also known as Dock180). Dock1 is highly evolutionarily conserved across species and can specifically bind and activate Rac1 [13–15]. In vitro and in vivo studies in various model organisms have shown that Dock1 influences a variety of cytoskeletal-related cell processes such as phagocytosis and cell migration [16–19]. Thus, Dock1 represents an ideal intracellular candidate to study for a role in cell shape regulation. Although Dock1 has been studied in several biological contexts and is expressed in Schwann cells , a role for Dock1 has not yet been described in Schwann cell myelination. The ability of Dock1 to initiate changes in cell shape to facilitate phagocytosis and cell migration makes Dock1 an attractive candidate to investigate for a role in regulated cell shape changes throughout the development of Schwann cells, particularly during stages of radial sorting and myelination, when Rac1 levels most influence Schwann cell biology . Two other members of the Dock1 family, Dock7, which activates the RhoGTPase Cdc42 , and Dock8 , which can activate Cdc42 and Rac1, have been shown to influence SCP migration through in vitro and in vivo knockdown experiments. Therefore, other members of the Dock1 family may also be key intracellular signals regulating the timing of Schwann cell development. In this study, we utilized zebrafish to study Schwann cell myelination , and we identify and characterize Dock1 as a regulator of early Schwann cell myelination. 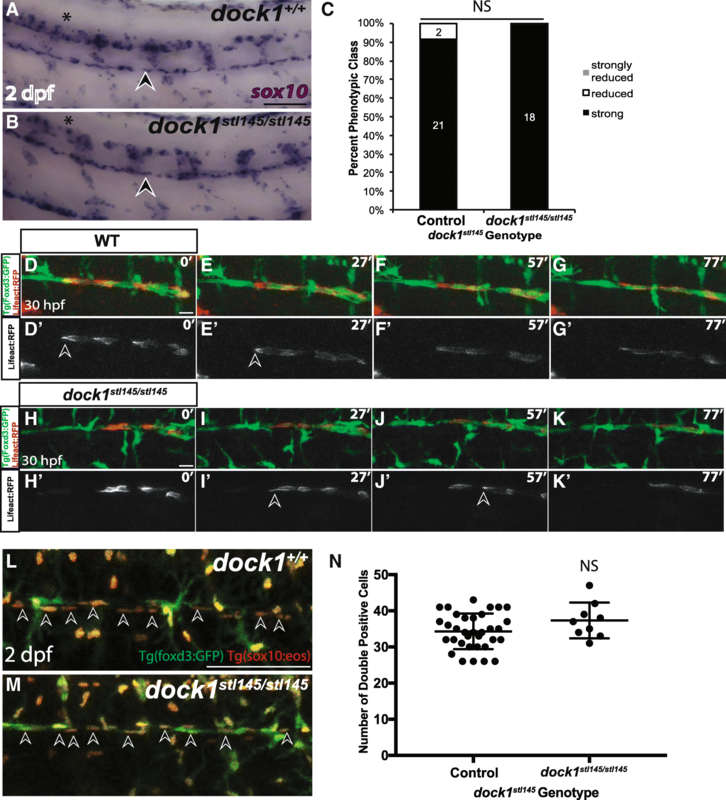 Although previous morpholino experiments in zebrafish have implicated dock1 in myoblast development and vasculature morphogenesis [23–25], a role for Dock1 in Schwann cell development has not been examined. In a screen for genetic regulators of myelination, we identified an early stop codon in dock1 that causes decreased expression of a mature myelin marker, myelin basic protein (mbp), in the PNS. Transmission electron microscopy (TEM) revealed that fewer axons are myelinated in mutants during early stages of myelin development, while axon number is not affected. We determined that SCP cell number and migration is not affected in dock1 mutants. Instead, radial sorting is delayed and early markers of myelination are reduced. These data suggest that Dock1 may contribute to the timely process extension of Schwann cells required for radial sorting and myelination. Zebrafish were reared in accordance with the Washington University IRB and animal protocols and were raised in the Washington University Zebrafish Consortium (http://zebrafish.wustl.edu/husbandry.htm). Zebrafish were crossed as either pairs or harems, and embryos were subsequently raised at 28.5 °C in egg water (5 mM NaCl, 0.17 mM KCl, 0.33 mM CaCl2, 0.33 mM MgSO4). Larvae were staged at hours post fertilization (hpf) and days post fertilization (dpf). The following mutant and transgenic strains were utilized in this study: dock1stl145, dock1stl365, dock1stl366, Tg(sox10(4.9):nls-eos) , Tg(foxd3:gfp) , and Tg(kdlr:mcherry) . Homozygous dockstl145 fish are viable as adults, therefore maternal zygotic (MZ) dock1stl145 animals were generated by crossing a dockstl145/stl145 female with a dock1stl145/+ male. To identify adult and larval zebrafish for either rearing or phenotypic analyses, the following primers were used to amplify a region of interest by PCR: stl145 F: 5’-CATAGGCGTTCTTCACTGAG-3′ and R: 5’-CGTATTTCCCACTAAACAGC-3′, stl365 F: 5’-GCAGCCACTTTAAAGCTTCCCG-3′ and R: 5’-GCTGCTTACCTTGCCCTTGTC-3′, and stl366 F: 5’-CCAGTGCCTCACTTCATATCTCC-3′ and R: 5’ CTCTTAGTCTCACGCAACACTCATG-3′. After PCR, a restriction enzyme digest assay was performed and the resulting fragments were analyzed on a 3% agarose gel. The stl145 C-to-T mutation disrupts a BstNI site so that the wild-type PCR product is cleaved into 48 and 527 base pair (bp) products, and the mutant PCR product is 575 bp. The stl365 allele contains a one bp insertion that disrupts an EcoRV binding site so that the wild-type PCR product is cleaved into 86 and 159 bp products, and the mutant PCR product is 245 bp. The stl366 allele contains a 13-bp deletion that disrupts a HpyCH4III site so that the wild-type PCR product is cleaved into 323 bp and 165 bp products, and the mutant PCR product is 488 bp. dock1stl145 was identified in a forward genetic screen described previously in [29, 30]. Phenotypically wild-type and mutant 5 dpf larvae were pooled and extracted DNA was sent for whole genome sequencing at the Genome Technology Access Center (GTAC) at Washington University. The wild-type to mutant allele ratio was determined using a bioinformatics pipeline generated in-house, and a SNP subtraction analysis suggested that dock1 was most likely the gene of interest . dock1 was confirmed as the gene responsible for the stl145 mutant phenotype through rescue experiments and complementation tests using two other dock1 mutant alleles, dock1stl365 and dock1stl366, which were generated by TALENs. The TALEN targeter tool (https://tale-nt.cac.cornell.edu/) and GoldyTALEN kit  were utilized to build each TALEN in a pCS2+ backbone. The repeat variable domains chosen for each stl365 TALEN arm and stl366 TALEN arm were: stl365 left arm: NN HD NG HD NI HD HD NG NN NI HD NN HD NI NN NI NN NI NN NI; stl365 right arm: HD NG NG NG NN NI NN NG NG NN NI HD HD HD NG NN NI NN NG; stl366 left arm: NN NG NG NI NG NI NG NG HD NI NG HD NG NN NI NI NN NN NI NN; stl366 right arm: NN HD NG NG NI NI NI HD NI NG NI HD NG NN NI HD HD HD NN HD. The TALEN constructs were transcribed with the mMESSAGE mMACHINE SP6 ULTRA Kit (Ambion) and equal concentrations (~ 50 pg) of left and right arm mRNA were injected into 1-cell stage wild-type embryos. Lesions that were successfully transmitted to the F0 germline were identified by restriction enzyme digest analysis as described above. Mutant bands were gel extracted using a QIAquick Gel Extraction kit (Qiagen) and then Sanger sequenced to identify the lesion. Posterior lateral line nerves (PLLn) were dissected from 6-month-old adult zebrafish. Animals were euthanized in ice water until gill motion ceased for 5 min, followed by transection of the hindbrain. Using angled forceps, the skin was pulled back from behind the operculum on both sides of the animal to expose the PLLn. Small spring-loaded dissection scissors were used to cut the PLLn near the operculum and then forceps were used to gently remove the nerve by slowly pulling the nerve toward the anterior of the fish. Both nerves were transferred to microcentrifuge tubes sitting on dry ice and then flash frozen in liquid nitrogen and stored at − 80 °C. To isolate RNA, 40 nerves were pooled from 20 different 6-month-old adult zebrafish and total RNA was obtained using standard TRIzol (Life Technologies) RNA extraction, with the exception of the homogenization method. Nerves were pooled into a total of 500 μl TRIzol and then thoroughly homogenized following these steps in succession: vortexing for 30 s, disruption with a plastic-tipped electric homogenizer for 1 min, and passaged through a syringe and successively smaller needles (22.5 and 27 gauge), 10 times each. To make cDNA, 1 μg of total RNA was reverse transcribed using the High Capacity cDNA Reverse Transcription Kit (Applied Biosystems) using random hexamers as per manufacturer instructions. RT-PCR for dock1 was performed on adult PLLn cDNA. The following primers were used: F: 5’-CGGAGTGGCCGTCTACAACTATG-3′ (bordering exons 1 and 2) and R: 5’-CAAGCCGGAAACACACCCTTC-3′ (bordering exons 3 and 4). Milli-Q water was used as a substrate for a control RT-PCR. Full-length zebrafish dock1 was cloned into pCS2+ using Gibson Assembly. dock1 was amplified in two pieces from zebrafish cDNA using a Phusion mastermix (NEB) and the following primers: part 1: F: 5’-TCTTTTTGCAGGATCCCATAGAGAAGCGAGAAAAAGTGTG-3′ and R: 5’-CTCCATGATGATCTGCACGTG-3′ and part 2: F: 5’-TCAGCGACATACTGGAGGTGC-3′ and R: 5’-TAATACGACTCACTATAGTTGAGGTGTCAGCTGCTTTTCCG-3′. Gibson Assembly was then performed using an in-house Gibson reaction mixture (gifted by the Solnica-Krezel lab, Washington University in St. Louis). Briefly, the fragments were gel extracted and purified using the QIAquick Gel Purification Kit (Qiagen). 30 ng of pCS2+, linearized with Clal and Xbal, were combined with 5-fold excess of the dock1 PCR fragments and 15 μl of the Gibson Assembly enzyme-reagent mixture. The mixture was incubated at 50 °C for 1 h and then 10 μl were transformed into DH5 alpha cells and plated on ampicillin plates. Subsequent colonies were grown, miniprepped with a Qiagen Kit, and Sanger sequenced. Synthetic mRNA for injection was generated by linearizing dock1 in pCS2+ with Not1 and then transcribing with the mMESSAGE mMACHINE SP6 ULTRA Kit (Ambion). Approximately 120 pg of dock1 mRNA in 2 nl was injected into 1-cell stage embryos generated from a dock1stl145 heterozygous in-cross. In situ hybridization for mbp was performed and scoring of expression was performed blinded to genotype. Whole mount in situ hybridization (WISH) was performed as described [32, 33] on larvae treated with 0.003% phenylthiourea from 24 h post fertilization (hpf) to inhibit pigmentation until fixation in 4% paraformaldehyde. The previously characterized riboprobes used in this study were: sox10 , krox20 , and mbp . All phenotypes were scored with the scorer blinded to genotype. The PLLn was scored for strength of staining: “strong” = strong and consistent expression along the entirety of the PLLn; “reduced” = consistent but reduced mpb expression along PLLn; and “strongly reduced” = patches of mbp expression or no expression, similar to scoring as performed previously . “Strong” mbp expression was assigned a value of 3, “reduced,” a value of 2, and “strongly reduced,” a value of 1 to code each phenotype as a number for a Chi-squared anaylsis. TEM was performed on 3 dpf, 5 dpf, and 21 dpf cross-sections of the PLLn according to standard protocols [38, 39]. Larvae were cut between body segments 5 and 6 and juvenile 21 dpf fish were cut immediately posterior to the heart. A Jeol JEM-1400 (Jeol USA) electron microscope and AMT V601 digital camera were used to image samples. Quantification of percent myelinated axons, sorted axons, total axon number, and number of Schwann cell nuclei was performed on the entire cross section of the PLLn. The scorer was blinded to genotype, and quantification was performed manually as described previously . One-cell stage zebrafish embryos were injected with ~ 15–20 ng of sox10:Lifeact-RFP (a gift from the Lyons lab, University of Edinburgh) and 25 ng of transposase mRNA. 1 dpf larvae were then screened for expression of sox10:Lifeact-RFP in Schwann cells at 24 hpf. For live-imaging, larvae were anesthetized in Tricaine and embedded in 0.8% agarose on a 35 mm glass bottom dish filled with 0.2% Tricaine and covered with a 22 × 22 mm2 coverslip on top of vacuum grease . The larvae were then imaged with a Zeiss LSM 880 confocal microscope at 20× for 3 h at 3 min intervals. Still images were captured with a Zeiss LSM 880 II Airyscan FAST confocal microscope at 40xW with a 1.8 zoom. To examine blood vesssls, 4 dpf larvae with Tg(kdlr:mcherry) were imaged at 13.5× with a Nikon SMZ18 fluorescent dissecting microscope. Tg(foxd3:gfp);dock1stl145/+ fish were crossed to Tg(sox10(4.9):nls-eos);dock1stl145/+ fish and offspring were screened for both transgenes at 1 dpf. At 2 dpf, larvae were placed in 0.8% low-melt agarose and mounted for imaging as described above. Before counting, larvae were individually exposed to 30 s of UV light using the DAPI filter with the 20× objective of a Zeiss LSM 880 confocal microscope. The number of GFP and RFP positive cells along the PLLn spanning ~ 8 body segments were the counted manually in ImageJ. The observer was blinded to genotype. 3 dpf larvae derived from a dock1stl145 heterozygous in-cross were incubated with 50 μl of DASPEI (40 mg/ 100 mL in distilled water) in 4 mL of egg water for 15 min at room temperature. The DASPEI solution was removed and replaced with fresh egg water. The number of neuromasts along the PLLn were counted under a fluorescent dissecting microscope using a GFP filter. Immunohistochemistry for acetylated tubulin was performed as described in  with mouse anti-acetylated alpha-tubulin used at a dilution of 1:1000 (Sigma). Larvae were fixed at 4 dpf and were derived from a dock1stl145 heterozygous in-cross. Heavy myosin within somites was detected with chicken MF 20 antibody at a dilution of 1:20 (Developmental Studies Hybridoma Bank). MF 20 was deposited to the DSHB by Fischman, D.A. (DSHB Hybridoma Product MF 20). For MF 20 staining, embryos were fixed at 1 dpf in 4% paraformaldehyde for 1 h and washed twice with 1X PBS for 10 min. Samples were then blocked with 0.05% Triton in PBS and 10% goat serum and then incubated with MF 20 in block overnight at 4 °C. After incubation, larvae were washed twice with PBS and then incubated secondary antibody in PBS for 2 h at room temperature. Primary antibodies were detected IgG2b with secondary antibody conjugated to either Alexa 568 or 488 (Invitrogen) at a 1:2000 dilution. Immunostained larvae were imaged with a Nikon SMZ18 fluorescent dissecting microscope. GraphPad Prism 7 was utilized to perform statistical tests. Unpaired t-tests with Welch’s correction were used to test significance of all TEM, neuromast number, and Schwann cell number data. A Chi-squared analysis was utilized to determine significance for all WISH data. Phenotypes of “strong,” “reduced,” and “strongly reduced” were assigned a number of 3, 2, or 1, respectively, in order to compare phenotypes with a Chi-squared analysis. An unpaired t-test with Welch’s correction showed no significant difference between wild-type and heterozygous animals; therefore, for TEM, WISH, neuromast, and Schwann cell number data, wild-type and heterozygous animals were combined as controls. An N-ethyl-N-nitrosourea-based forward genetic screen to identify novel genetic regulators of myelination [29, 30] uncovered a mutant, allele designation stl145, that exhibits reduced mbp expression in the PNS by whole mount in situ hybridization (WISH). Reduction of mbp expression, scored qualitatively in the posterior lateral line nerve (PLLn) (Additional file 1: Figure S1), is most striking at 3 days post fertilization (dpf) (Fig. 1a, b), during early stages of PNS myelination. At 5 dpf, mbp expression has increased in the stl145 mutant PLLn, but is still reduced compared to sibling controls (Fig. 1c, d). To identify the causative mutation, we employed whole genome sequencing (WGS) of DNA pools from phenotypically mutant and phenotypically wild-type siblings. Analysis of WGS data  showed the causative mutation was located on chromosome 12 (Fig. 1e). Within the most highly linked region of chromosome 12, the most likely causative mutation was a C-to-T transition resulting in a premature stop codon within the Rac1 binding domain (DHR2 domain) encoding region of dock1 (Fig. 1f, g). Genotyping revealed that dock1stl145/stl145 homozygous mutations corresponded to decreased levels of mbp expression in the PNS at 3 dpf (p < 0.0001) and at 5 dpf (p < 0.0001) (Fig. 1h-j). To definitively demonstrate that this premature stop codon was causative for the stl145 phenotype, we performed a rescue experiment with wild-type dock1 synthetic mRNA. Injection of 120 pg of full-length synthetic dock1 mRNA into 1-cell stage embryos derived from an intercross of dock1stl145 heterozygotes suppressed the mbp phenotype in stl145 mutants at 3 dpf (p = 0.0001) (Fig. 2 a-e). Additionally, we generated two new alleles of dock1 using TALENs. The stl365 allele generates a premature stop codon in the DHR2 domain, similar to the stl145 allele (Fig. 2 f; Additional file 2: Figure S2 A,B). The stl366 allele causes a premature stop codon generated just after the SH3 domain (Fig. 2 f; Additional file 2: Figure S2 C,D). Both alleles exhibit decreased mbp expression in the PNS (p < 0.0001) and fail to complement with the stl145 allele (dock1stl145/stl365 = 4/4, dock1stl145/stl365 = 6/6; Fig. 2 g-l). To confirm that dock1 is expressed in Schwann cells of zebrafish in addition to mammalian Schwann cells , RT-PCR for dock1 was performed on cDNA from adult PLLn, which is enriched in Schwann cell nuclei. This analysis showed that dock1 is expressed in the PLLn (Additional file 2: Figure S2 E,F). Together, these results confirm that the stl145 phenotype is the result of the premature stop codon in dock1. The phenotype of these new mutants suggests a previously unappreciated role of Dock1 in Schwann cell development. We next investigated which stages of Schwann cell development are affected in dock1stl145 mutants. To interrogate if the decrease of mbp expression in dock1stl145 mutants is the result of decreased myelination, we employed TEM to analyze the ultrastructure of the PLLn at 3 dpf and 5 dpf. At 3 dpf, consistent with WISH for mbp, the percentage of myelinated axons in the PLLn of dock1stl145 mutants is significantly reduced compared to siblings (p < 0.0001), while the number of axons is not significantly altered (p = 0.0983) (Fig. 3a-d). At 5 dpf, dock1stl145/stl145 mutant axon number is similarly unaffected (p = 0.3031) while mutants did exhibit a significant decrease in the percentage of myelinated axons compared to controls (p = 0.0003), although this phenotype is more variable compared to the mutant phenotype at 3 dpf (Fig. 3 e-h). dock1stl145/+ larvae do not exhibit decreased myelination compared to wild-type siblings at 3 dpf (p = 0.6549 percent myelinated axons; p = 0.7258 total axon number) or 5 dpf (p = 0.7297 percent myelinated axons; p = 0.6924 total axon number); thus, wild-type and heterozygous siblings were combined as controls. 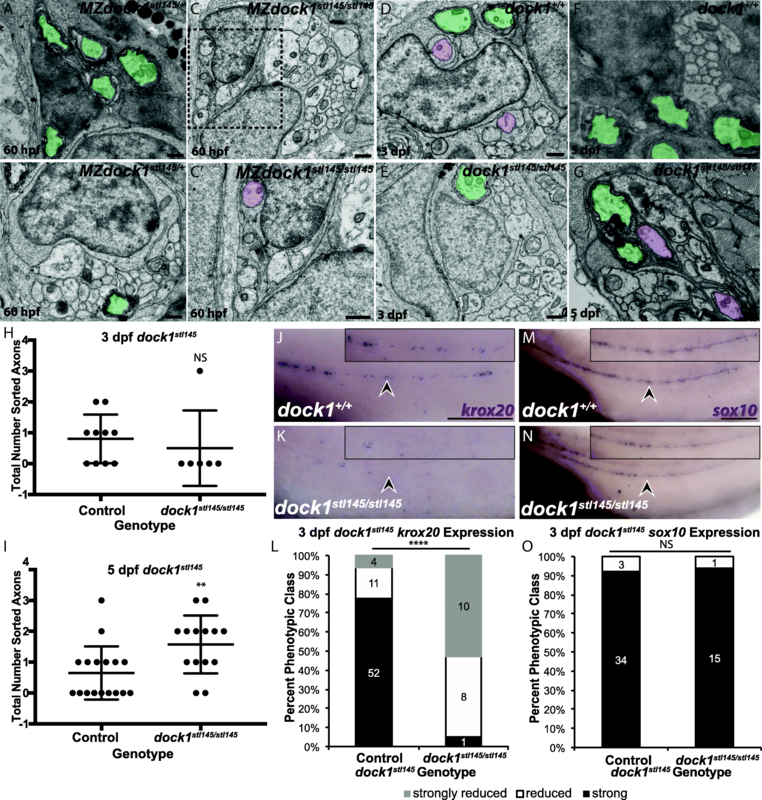 The presence of myelinated axons at 5 dpf in dock1stl145/stl145 larvae, although fewer in number compared to controls, illustrates that Schwann cells do possess the capability to myelinate axons in dock1 mutants. Maternal zygotic (MZ) dock1stl145 mutants at 5 dpf also exhibit a reduction in the number of myelinated axons compared to MZ dock1stl145 heterozygotes (p = 0.0183) (Additional file 3: Fig. S3 a-d). No significant difference in the percent myelinated axons was observed between zygotic dock1stl145 mutants and MZ dock1stl145 mutants (p = 0.8300). To test if a defect in myelination is consistent between alleles, we performed TEM on dock1stl366 mutants and siblings. These mutants also display a significantly decreased percentage of myelinated axons at 3 dpf (p = 0.0072) with no significant difference in axon number (p = 0.3775) (Additional file 3: Figure S3 E-H). A slight reduction in the percent myelinated axons of the PLLn persists at 21 dpf in MZ dock1stl145 mutants (p = 0.0155), while axon number (p = 0.5831) and Schwann cell nuclei number (p = 0.1583) are not significantly altered compared to MZ dock1stl145 heterozygous controls (Additional file 4: Figure S4). 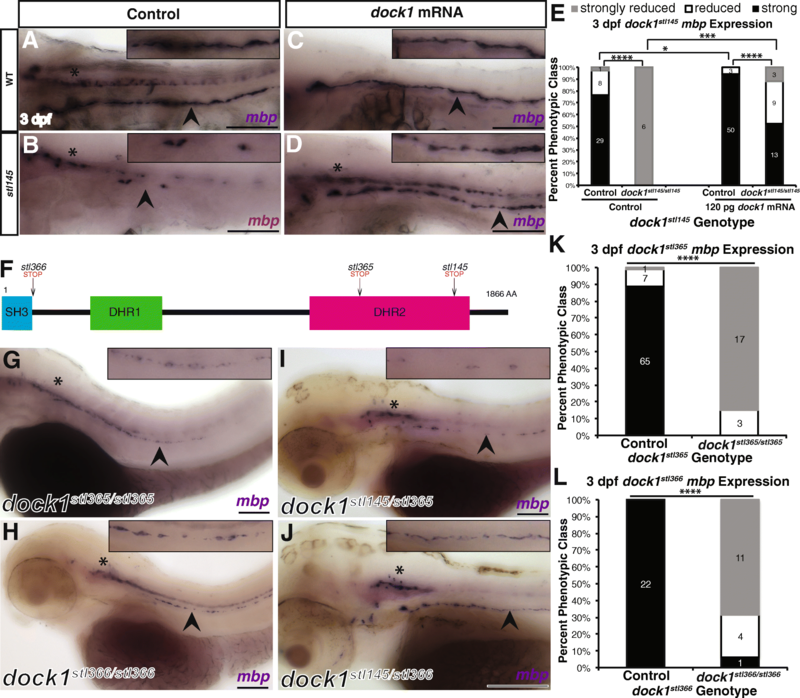 These results show that dock1 mutations lead to reductions in the number of myelinated axons, and that these effects are more pronounced at early stages of development. To understand why myelination is decreased in dock1stl145 mutants at 3 dpf, we examined earlier stages of Schwann cell development, beginning with SCPs. Importantly, global development of dock1stl145 mutants is normal and overt PLLn defects are not observed (Additional file 5: Figure S5 A-F). Acetylated tubulin staining shows that axons extend down the trunk of larvae and neuromast number is not significantly altered (p = 0.7518), (Additional file 5: Figure S5 G-I). dock1stl145/+ larvae and wild-type siblings do not exhibit a significant difference in neuromast number (p = 0.0727) and were thus combined as a control. Additionally, blood vessels (kdlr:mcherry positive) and somites (MF 20 positive) can develop in zygotic dock1stl145 mutants (Additional file 5: Figure S5 J-M). Previous studies have demonstrated that Dock1 can regulate cell migration , and two other members of the Dock family of GEFs, Dock7  and Dock8  affect Schwann cell migration. Therefore, we examined if cell migration in dock1stl145 mutants is perturbed by performing WISH for sox10, which marks all stages of Schwann cell development, including SCPs. At 2 dpf, SCPs have migrated and populated the PLLn in control larvae as evidenced by strong and consistent expression of sox10 along the entire length of the PLLn (Fig. 4 a). We found that dock1stl145/stl145 mutants also exhibit consistent and strong expression of sox10 along the PLLn (p = 0.3522), demonstrating that SCP migration is not impaired and that Schwann cells populating the PLLn are thus poised to myelinate (Fig. 4b, c). Dock1 has been shown to regulate the actin cytoskeleton in other systems; therefore, we hypothesized that actin cytoskeletal dynamics might be altered during SCP migration in dock1stl145 mutants. We performed live-imaging of the PLLn in tg(foxd3:gfp); dock1stl145 wild-type, heterozygous, or mutant larvae that also mosaically expressed sox10:Lifeact-RFP, which binds and fluorescently labels F-actin in cells expressing sox10 . Live-imaging from ~ 30–33 hpf did not reveal any overt defects in migration or in actin cytoskeleton localization (Fig. 4d-k; Additional file 6: Movie S1, Additional file 7: Movie S2, Additional file 8: Movie S3 and Additional file 9: Movie S4). In both control and dock1stl145 mutant larvae, F-actin was consistently localized to the back of migrating SCPs. To our knowledge, this is the first time live actin dynamics have been reported in migrating SCPs in vivo. High-resolution still images also show LifeAct distributed throughout the cell with the highest concentration at the back of SCPs (Additional file 10: Figure S6). Because migration is not affected in dock1stl145 mutants, we examined whether decreased myelination in dock1stl145 mutant nerves was the result of fewer Schwann cells. To do this, we generated and analyzed 2 dpf double transgenic tg(foxd3:gfp);tg(sox10:nls-eos);dock1stl145 larvae. The sox10:nls-eos transgene enabled manual counting of Schwann cell nuclei along the PLLn, while the foxd3:gfp transgene provided a co-label to ensure Schwann cell identity. Counting the number of double positive cells at 2 dpf showed that dock1stl145/+ and wild-type siblings do not exhibit a significant difference in cell number (p = 0.2218) and were thus combined as the control group. No significant difference in the number of Schwann cells between mutants and control siblings was observed (p = 0.1243), suggesting that a reduction in Schwann cell number is not a contributing factor to decreased myelination of the PNS in dock1stl145 mutants (Fig. 4 l-n). Overall, these experiments demonstrate that SCP migration and number are not overtly affected in dock1stl145 mutants. Given that the dock1stl145 mutation does not alter SCP migration, we next asked if Schwann cell development was affected at the immature and pro-myelinating Schwann cell stages using TEM. At 60 hpf, Schwann cells in MZ dock1stl145 heterozygous siblings have begun to myelinate axons whereas MZ dock1stl145 mutants are extending processes into axon bundles and can be found in the promyelinating, but not myelinating state (Fig. 5 a-c′). This phenotype suggests that radial sorting by Schwann cells is delayed in in dock1stl145 mutants. We then hypothesized that radial sorting delays at 3 dpf in dock1stl145 mutants might result in higher numbers of Schwann cells associated with axons in a 1:1 ratio at 5 dpf as more Schwann cells have entered the pro-myelinating state. Indeed, compared to 3 dpf, a greater number of Schwann cells are associated in a 1:1 ratio with axons in dock1stl145 mutants (3 dpf: p = 0.6068; 5dpf: p = 0.0086) (Fig. 5 d-i). To further test if Schwann cells are developmentally delayed at the pro-myelinating state, we examined expression of krox20 (egr2), a transcription factor that initiates expression of myelin associated genes. By WISH, krox20 expression is significantly decreased along the PLLn of dock1stl145/stl145 mutants compared to wild-type and heterozygous control siblings at 3 dpf (p < 0.0001), demonstrating that dock1stl145 mutant Schwann cells are developmentally delayed compared to their siblings (Fig. 5 j-l). This reduction in krox20 expression is not a result of an absence of Schwann cells because sox10 positive Schwann cells are present along the PLLn by WISH at 3 dpf (p = 0.8141) (Fig. 5 m-o). 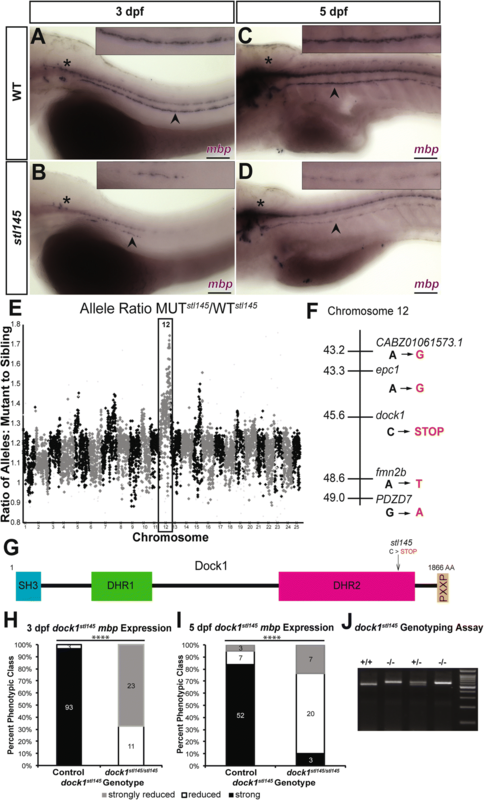 Together, these data show that dock1stl145 mutants exhibit delays in development that begin during radial sorting and extend throughout initial myelination of the PNS in zebrafish. A critical component of Schwann cell development is the remodeling of the cytoskeleton to promote shape changes to facilitate proper myelination of the PNS [3, 43]. Although some of the intracellular components involved in cytoskeletal rearrangements have been identified, such as Rac1, the full complement of proteins involved in this process has not been comprehensively defined. Through a forward genetic screen in zebrafish, we identified an early stop codon in the Rac1 binding domain of dock1, an atypical GEF, that causes decreased mbp expression in the PNS at 3 dpf and 5 dpf. Rescue experiments and complementation tests with two newly engineered alleles of dock1 confirmed that mutations in dock1 result in decreased mbp expression. TEM analysis showed fewer myelinated axons in mutants at 3 dpf, 5 dpf, and 21 dpf, whereas axon number is not significantly affected at any stage assessed. However, we did note that several unmyelinated axons in some mutant nerves were abnormally large in diameter and had many mitochondria (data not shown). We demonstrated that reduced mbp expression and the reduction of myelinated axons in mutants is not caused by absence or loss of Schwann cell number. While two other members of the Dock1-family of atypical GEFs, Dock7 and Dock8, affect SCP migration in mammals [20, 21], this does not appear to be the case of Dock1 in zebrafish. This is not entirely unexpected, since loss of Rac1 in mouse Schwann cells did not affect Schwann cell migration [5, 6]. Although overt defects in migration were not detected using live-imaging, these experiments enabled visualization of F-actin localization, which showed that F-actin is localized at the back of migrating Schwann cells. This live-imaging data with Lifeact supports previously reported data from 3D culture of Schwann cells showing that migrating Schwann cells in vivo move in an amoeboid-like fashion , as contractions seem to occur at the back of the cell. In the future, it will be interesting to generate dock7 and dock8 zebrafish genetic mutants and observe how migration and F-actin localization is affected in SCPs. Although a significant reduction in the percent myelinated axons is observed at 5 dpf, Schwann cells in dock1stl145 mutants do have the capability to myelinate axons, suggesting that dock1 is involved in the timing of myelination onset. It is also possible that other Dock1 family members compensate for dock1 loss of function in our mutants. Further experiments are needed to determine if Dock1 functions in a Schwann cell-autonomous or non-cell-autonomous manner. Consistent with data showing that dock1 mutant Schwann cells are delayed in radial sorting and myelination, expression of krox20, a transcription factor essential for expression of myelin genes, is decreased in dock1stl145 mutant nerves. Importantly, Schwann cell number is not affected in dock1stl145 mutants and overall PLLn development is not affected in dock1stl145 mutants compared to controls, as determined by acetylated tubulin staining and counting neuromast number. Combined, these data demonstrate that Schwann cell radial sorting and myelination are delayed in dock1 mutants. How might Dock1 regulate Schwann cell radial sorting and myelination? GEFs are proposed to aid in regulating the spatial and temporal activation of RhoGTPases, such as Rac1 . During the course of development, Schwann cells undergo unique and critical cell shape changes during migration, radial sorting, and myelination. We hypothesize that to regulate the cytoskeletal rearrangements necessary for such functions, Schwann cells utilize a “tool-kit” of GEFs – both canonical and atypical – to activate RhoGTPases, which subsequently remodel the cytoskeleton. For example, Dock7 and Dock8, in addition to canonical GEFs, Dbl’s big sister (Dbs)  and Tiam1 , have already been shown to regulate SCP migration. Dock1 may be activated after Schwann cells have migrated to subsequently promote radial sorting and early myelination. Because few GEFs have been shown to play a role in Schwann cell development in vivo, important next steps in elucidating the discrete signals necessary for development will be to define the repertoire of active GEFs, particularly after SCP migration (Fig. 6). RhoGTPases, like Rac1, are ubiquitous and important for initiating cytoskeletal rearrangements as well as other cell biological processes; therefore, different GEFs may be utilized to activate RhoGTPases cell-specifically. Previously, it has been shown that Rac1 activation regulates Schwann cell radial sorting and myelination  in addition to promoting the transition from Schwann cell migration to radial sorting . Because Dock1 has been shown to specifically bind and activate Rac1 in various biological contexts, we hypothesize that if Dock1 functions cell-autonomously, it may be one of many GEFs that activate Rac1 in Schwann cells. Multiple GEFs working together in concert could increase the total levels of activated Rac1 during a critical period in Schwann cell development to enable the process extensions necessary for radial sorting and myelination. One explanation of our data is that Schwann cell radial sorting and myelination is slower in dock1 mutants because activated Rac1 levels have not reached a critical threshold to promote these processes. In the future, as better in vivo Rac1 sensors are developed, it will be interesting to test this hypothesis. Additionally, Dock1 may function redundantly with other GEFs. As radial sorting and myelination are critical for PNS health, many GEFs may converge on the same pathway such that if only one GEF is dysfunctional, radial sorting and myelination can still proceed, albeit at a slower rate. Alternatively, Dock1 may function in neurons and mutations in dock1 may indirectly affect Schwann cell development. The cell autonomy of Dock1 function and the upstream signals that trigger Dock1 activation remain to be elucidated. Dock1 has a DHR1 domain that can bind phosphatidylinositols  located in the cell membrane, making Dock1 is an attractive candidate to serve as a link between cell surfaces receptor and the cytoskeleton. Additionally, Dock1 could be a representative of a class of drug targets for diseases affecting peripheral myelin, especially because GEFs may contribute to myelination disease states in human patients [4, 46–48]. Although RhoGTPases are critical for cytoskeletal rearrangements, their ubiquity in many cell types limits their ability to serve as useful therapeutic drug targets. Alternatively, GEFs, particularly atypical GEFs like Dock1, could open a door to indirectly affect RhoGTPases in a more cell-specific manner and thus influence the cell shape changes that promote proper Schwann cell development and myelination. In this study, we demonstrate that mutations in an atypical GEF, dock1, result in defects in Schwann cell radial sorting and myelination. Schwann cells are slower to extend processes into axon bundles and subsequently myelinate fewer axons. Schwann cell number and migration are not affected in these mutants; however, Schwann cells in dock1 mutants fail to robustly express markers such as mbp and krox20 in early development, suggesting that dock1 aids in the temporal regulation of Schwann cell radial sorting and development. Moreover, Dock1 may represent a link between extracellular signals and the intracellular cytoskeletal rearrangements necessary for radial sorting and myelination. We thank members of the Monk, Solnica-Krezel, and Kaufman laboratories for assistance with the screen and helpful discussions; the Washington University Center for Cellular Imaging; the Washington University Zebrafish Consortium; S. Kucenas (University of Virginia) for the Tg(sox10(4.9):nls-eos) line; D. Lyons for the sox10:lifeact-RFP plasmid; C. Shiau (University of North Carolina) for the Tg(kdlr:mcherry) line; M. Mokallad (Washington University) for the acetylated alpha-tubulin antibody, and the Solnica-Krezel laboratory (Washington University) for the MF 20 antibody. A.L.H., B.L.H, S.D.A., and K.R.M. performed the genetic screen and identified the stl145 mutant. R.L.C. and K.R.M designed research, and R.L.C. performed research. R.L.C. and K.R.M analyzed data, and R.L.C. and K.R.M. wrote the paper. All authors edited and approved of the manuscript. R.L.C. is supported by the National Science Foundation Graduate Research Fellowship (DGE-1745038). This work was also supported by the Philip and Sima Needleman Student Fellowship in Regenerative Medicine (A.L.H.) and by the National Institute of Neurological Disorders and Stroke (NINDS) Grants F31 NS096814 (A.L.H), F31 NS094004 (to B.L.H. ), and F31 NS087801 (to S.D.A. ), and by a National Institute of Child Health and Human Development Grant R01 HD80601 (to K.R.M.). K.R.M. is a Harry Weaver Neuroscience Scholar of the NMSS. Data, reagents, and zebrafish lines available on request from the authors. Zebrafish were reared in accordance with the Washington University IRB and animal protocols and were raised in the Washington University Zebrafish Consortium (http://zebrafish.wustl.edu/husbandry.htm).